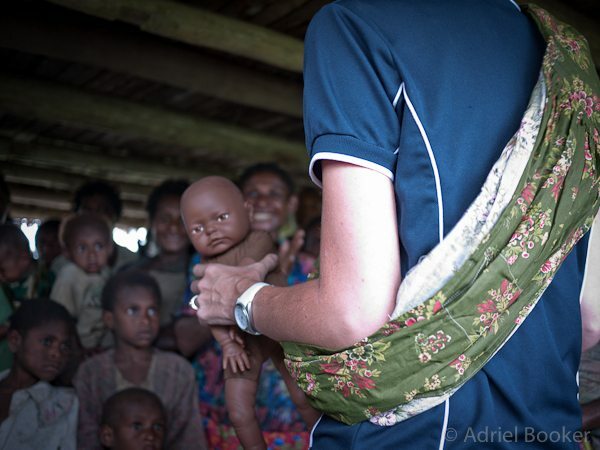 Project Baby Bilum – How a malnourished baby inspired the babywearing community and other women to support moms in need in Papua New Guinea. She should have been dead. When we met her last year she was three months old yet was smaller than my littlest son was at birth. 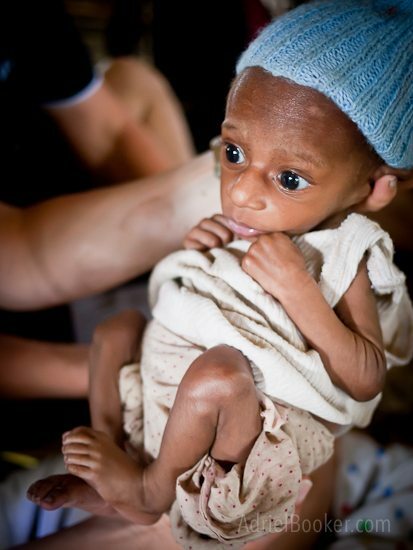 No 12-week-old should weigh less than six pounds. At an age where she should have been holding her head up, reaching for nearby objects, and flashing her toothless grin she was barely awake for long enough to let out weak pleas for food. Umi was a heart-breaker. She was not just another beautiful baby to us (although she was beautiful), she was a little girl that encapsulated the struggle of a people often forgotten by the rest of the world. 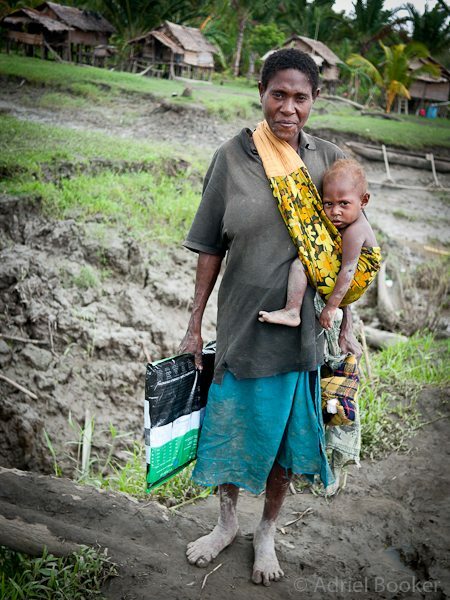 In Umi’s village in the Bamu River region of Western Province, Papua New Guinea there is severe poverty, bringing with it very little access to education, unsafe water sources, extremely poor nutrition, and a whole slew of other (depressing) issues, fundamental to their long-term development. 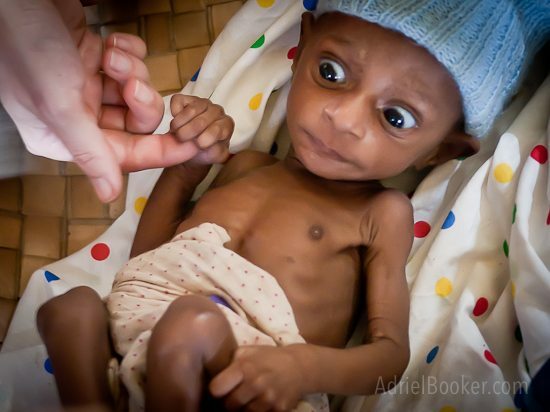 As we got to know Umi’s mother we realized the origin of Umi’s severe malnutrition. Komi spent long days out gathering sago (a tree root which is the main local food source) while leaving Umi behind with a caregiver. As it has traditionally been for generations, it was Komi’s responsibility to gather sago for her husband and children. But in doing so, she was unaware of the horrible ramifications: her youngest baby was actually starving to death in her absence. What Komi didn’t understand was that Umi was so malnourished—so weak—that she literally couldn’t muster the strength to wake and cry for food as often as she needed it. 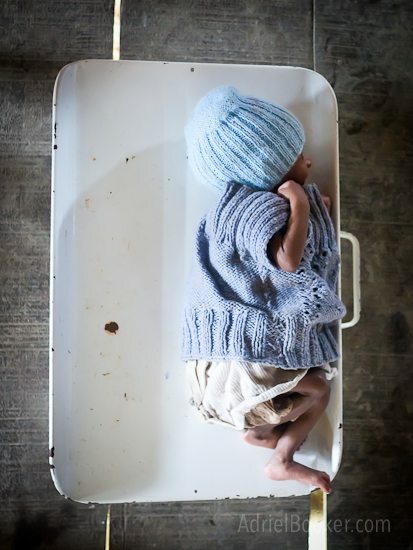 It wasn’t that Komi was an unfit or uncaring mother; the problem was that she wasn’t educated on nutrition and baby care and the importance of on-demand feeding during the early newborn days. She simply didn’t know how she was contributing to the issues of her “sick” baby… and as a result she wasn’t leaving Umi with much of a fighting chance at life. Komi’s husband had died of tuberculosis the week before we arrived and she was left to care for her three young children alone and with very little resources at her disposal. Anyone in her situation would be tempted to feel hopeless about the future and we wondered – does she even have the will to fight for her family’s lives anymore? Just how broken is her heart already? Our medical team cared for Umi and her mother (as well as Umi’s brother and sister) over the two days we were there – administering immunizations and vitamins and giving them rice and some warm baby clothes and blankets. We encouraged them, we prayed for them, and we befriended them. I drew up a feeding chart for Komi, showing her how to cross off boxes every time she fed Umi in between each sunrise, and left her with a pen and a prayer and eight weeks worth of hand-drawn calendars with eight boxes a day to tick off. Would she use the chart? Would she wake Umi to eat and work to keep her awake until she was full? Would she persevere? Did she understand the gravity of their situation? Did she realize that Umi was starving… to death? Would she make changes? Would others in the village help and support them by giving her and her other children food while she took a period of time to stay with Umi and focus on round-the-clock feeding? Would she gain hope for their future? We left with so many questions. Where is Umi now? What happened to her and Komi? With no way of staying in touch with anyone in this remote village (no electricity, no cell phones, no internet, no “postal” service) our questions went unanswered for a year. 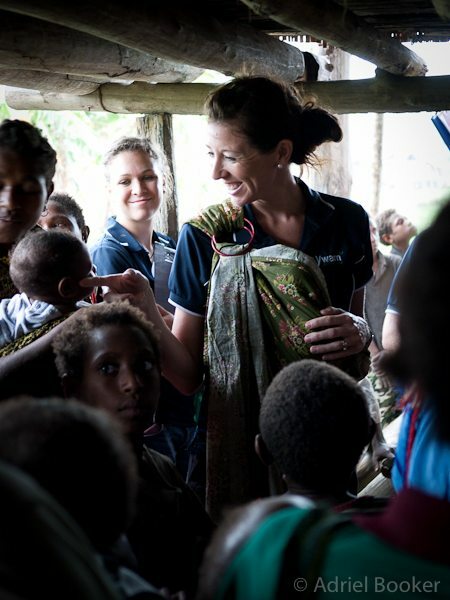 When we returned to her village—Bamio—during my trip to PNG last month, we prepared ourselves to hear of Umi’s death. Because really, there’s no way she should have survived. The odds were so utterly stacked against her. We set foot on the muddy banks of Bamio with trepidation and trembling and only a sliver of hope, but what we found was the unfolding of a very different story. Although Umi and Komi and their family weren’t there when we returned, we learned that Umi did indeed pull through. 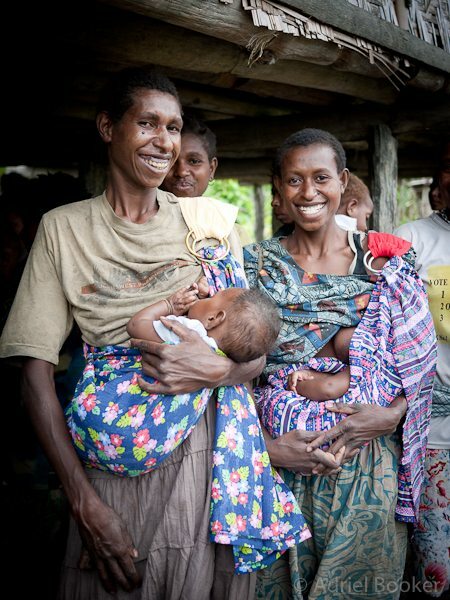 Nine months prior to our visit, Komi and her three children moved back to her family’s village in the Gama River. (Several days paddle away by dugout canoe.) 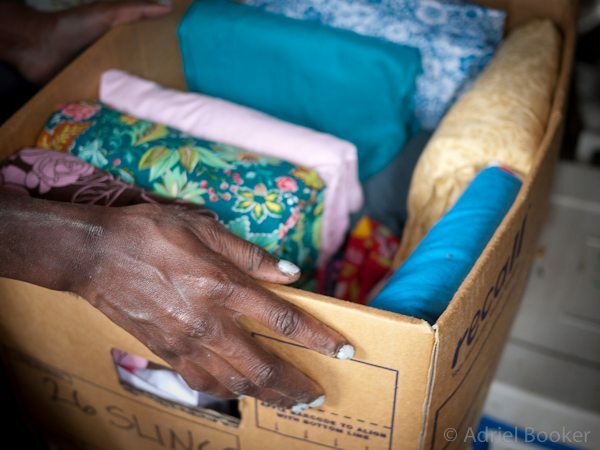 Since Komi’s husband died she no longer had ties in Bamio and so moved back to be among her own family, where they would ensure the widow and her children were taken care of. Komi and Umi’s most recent visit to Bamio was a only a month before our return so we were delighted with a fresh, month-old report of Umi alive as a 14-month-old! Although we don’t know exactly how well she is since our team couldn’t evaluate her health and development, we were told that she has grown “fatter” and is doing well. Do they know what a miracle her survival is? I learned something during that trip in a way that will forever be lodged in a deep place within my heart and my memory: when circumstances and experiences and evidence all add up to impossibility… possibility still remains. I knew this to a degree – having experienced some miracles in my own life – but seeing it in tiny baby Umi who was teetering on death’s doorstep before beating the odds of infant mortality drove it home in a new way. Little baby Umi’s life is a miracle. There’s just no other way to describe it. Everything about her and about her situation pointed to certain death and yet somehow, against all odds, she made it past her first birthday. Umi taught us that nothing is impossible with God. She taught us that there is a strength that just might surface when all else seems to fail. She taught us that hope—if given a chance—does not disappoint. There’s a quiet resilience in those who live in poverty that is difficult for the rich—us—to understand. 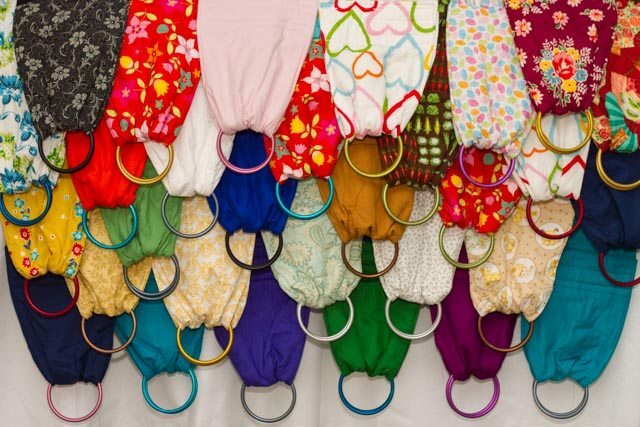 Umi’s legacy: Project Baby Bilum – the gift of baby slings to mothers engulfed in poverty. When I returned home I shared Umi’s story, putting the need out there and asking readers if they’d like to help. And then? Sling after sling after sling began turning up in my mailbox. 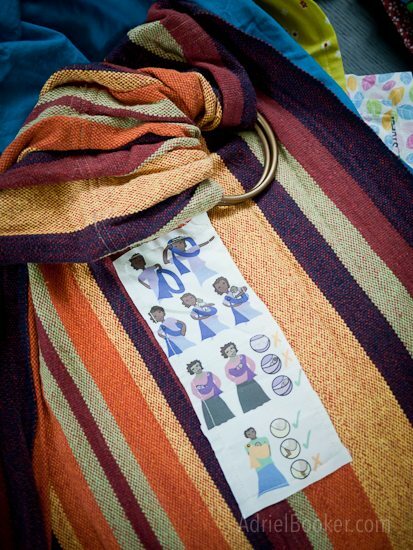 It was a huge privilege to personally deliver these slings to the women of Bamio this year. 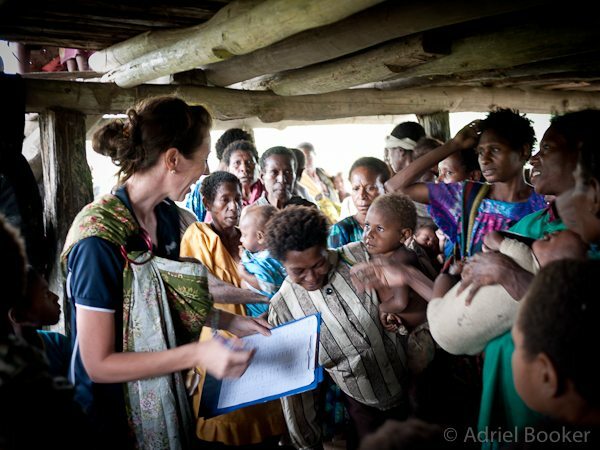 We literally gathered the entire village of women – young and old, mothers, grandmothers, and not-yet-mothers – for a morning of teaching on pregnancy, birth, breastfeeding, baby care, and family planning. We taught them how and why to use clean birth kits, gave some basic breastfeeding education, and demonstrated how to safely use a baby sling – not only for feeding but to promote bonding and development and the overall health of the child. And then, one by one the women came forward and choose a sling. Perhaps it’s just a little thing, but it brought me so much joy to be able to let them choose a color or pattern that they liked. If there’s a way to instill dignity and hope in women, I’m convinced it has something to do with choice and beauty and knowledge-as-power. I’m convinced it’s being empowered to excel at life just that little bit more. 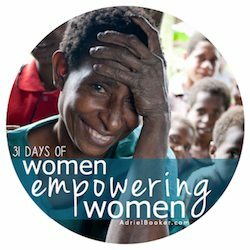 Each woman came forward, shy and yet eager, and then each woman left with a little more freedom, a little more opportunity, and a little more understanding of how she might change her family’s destiny. My goodness, it was a thrilling and exhausting and absolutely beautiful day. You know – one of those days that our cheeks hurt from smiling so much. 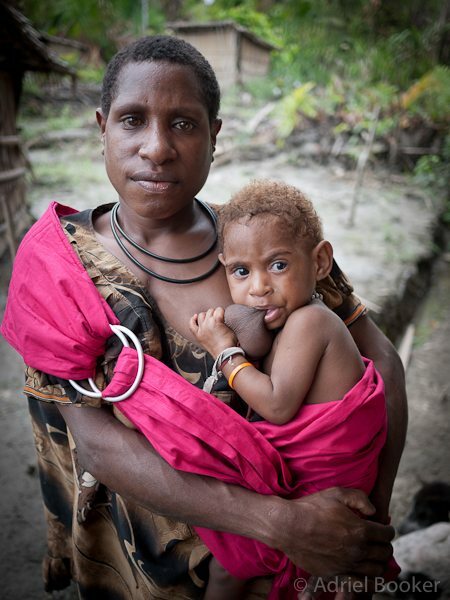 On my way back to the muddy banks of the Bamu where I would board a zodiac to take me back to our medical ship, I came across this stunning woman and her child. She had just crossed a river by foot bridge (a very skinny, slippery, barkless log), holding her baby in a sling with items dangling from each hand. Seeing her stand tall and proud and able to manage so confidently just about made my heart explode. 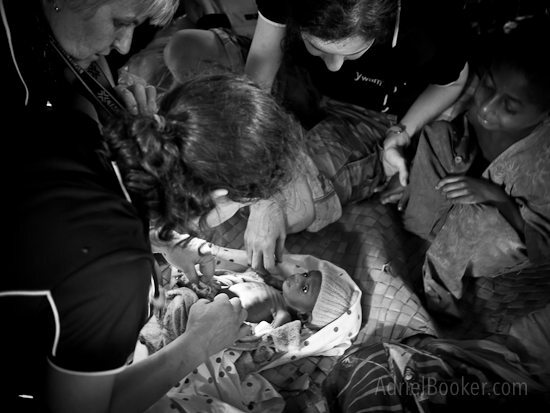 We left Bamio that day proud of Umi’s legacy – a story that paved the way for other mothers and babies to be helped through the simple project and the simple generosity of women around the world who care about life beyond themselves. And we left that day amazed and inspired. 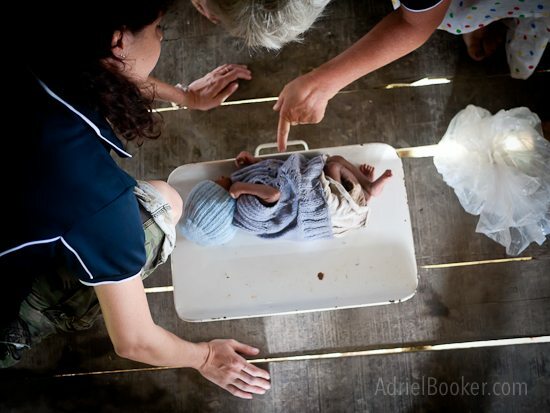 If a baby like Umi can live against all odds, then what is a village and nation full of Umis and Komis capable of? p.s. I just have to add a post script saying that when we found out the village Komi and Umi had moved to, we realized that it was the same village we had visited the day before we arrived in Bamio. (!!!) We only stopped there five minutes – just long enough to drop off mosquito nets – on our way out of another river system after a long, full day of mobile clinics. It was getting dark and we still had a couple of hours’ journey to return to the Medical Ship so we didn’t even get out of the zodiac for distribution. Had we known who now lived in that village, we may have slightly altered our plans – at least to find Umi and Komi and say hello. (Can you imagine?!!!) For all we know, we caught a glimpse of a little 15-month-old Umi, tucked behind the skirt of one of the women waiving to us from shore. How’s that for crazy-amazing?? Gorgeous! Amazing!!! The post I’ve been waiting for! YAY. 😀 I’m so thrilled to be able to bring back a wonderful report. Praise God for that good news. That is a beautiful story. 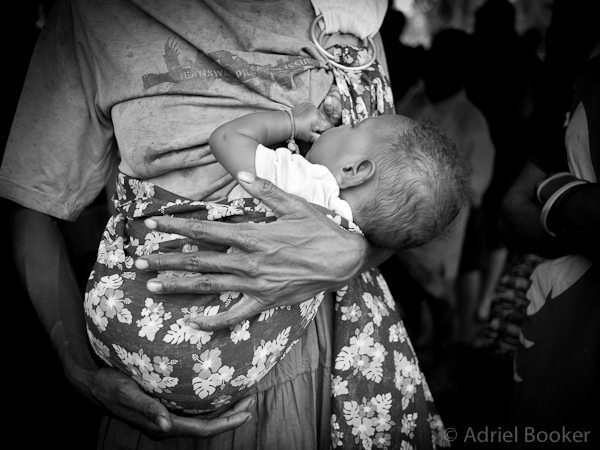 Such a creative idea to provide slings for them. I would have never guessed that they didn’t already have a way for baby wearing. yeah lindsay, it was a shock to me, too. SO happy to hear about Umi’s well being. I have been following her story. Thank you so much for sharing. The mommy in me can’t help but smile, knowing that baby Umi is not dead, but continuously surviving her journey to life. Incredible and wonderful and powerful. We have a lot in common dear one. I hope to head to Kenya at the beginning of the year to record the delivery of hospice buckets ministering to AIDS patients and other terminally ill people. I can’t see life through any other eyes. Bless you. WOW! This is incredible and beautiful and heart-wrenching all at once. God is so good. I love hearing what you’re up to, what HE’S up to. 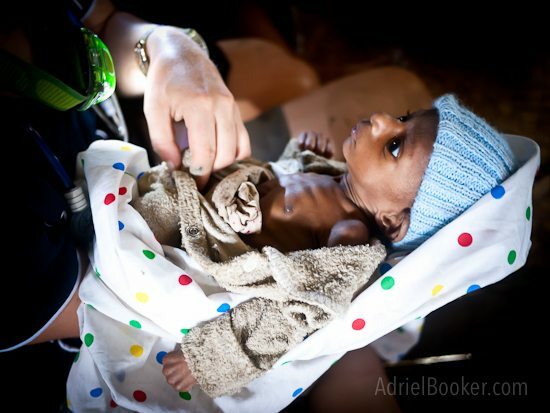 Absolutely amazing, Adriel. I spent significant time in 3rd world nations as a teenager and young adult, doing missions stuff, and as my life has gone on and I’m married with kids in the States, I feel like I’ve lost touch a bit with the heart of God in THAT stuff. Makes me want to come visit y’all… 🙂 Thanks for sharing this, friend. As a working mother who entrusts my children to a caretaker five days a week, I often think about how women in other cultures go about their work and care for their children. In my mind, I assumed they wore their babies. I thank you for bringing this story to light! This is so beautiful! What an inspirational story and what a blessing for you to serve in this way! A testament to never losing hope, even in the bleakest of circumstances! This is really incredible and beautiful story. Thanks for sharing.